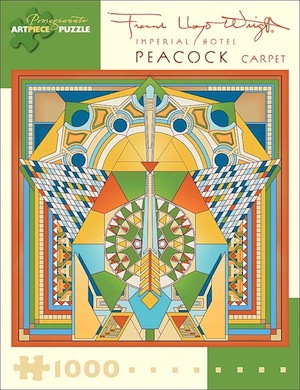 Adapted from Peacock Carpet, Imperial Hotel, Tokyo, 1917, by Frank Lloyd Wright (American, 1867–1959). Thoughtfully conceived and engagingly intricate, this 1,000-piece interlocking jigsaw puzzles combine superb color reproduction, stunning and unusual images, and sturdy construction to delight generations of novice and veteran puzzleworkers. Puzzle size: 25" x 25".